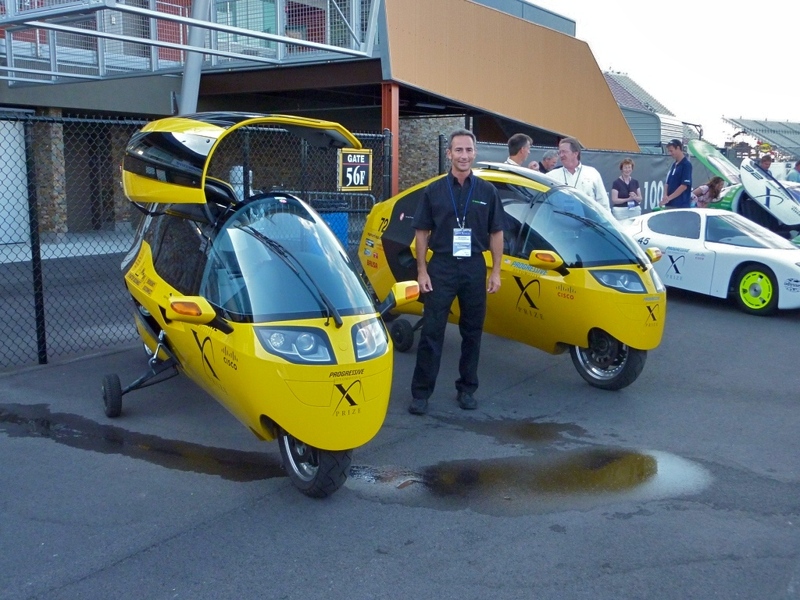 Also see Progressive Automotive X PRIZE’s blog entry: A Race to the Finish! The Finals closing event was held on Tuesday. Vehicles were loaded first thing Wednesday morning to be carried to the Chrysler Proving Grounds in Chelsea, Michigan. On Wednesday the team was at Chelsea preparing for the Friday coastdown event. Thursday the team will be cleaning and saying goodbye to their garage at Michigan International Speedway. Team X-Tracer having a good time barbecuing at our motel on Saturday together with some X Prize media staff after it was clear that we were the only ones left in the Alternative Tandem division. Peraves's US representative Jim Lorimer with E-Tracer 79 and 72 during the Finals closing event on Tuesday at the Michigan International Speedway. X PRIZE Finalist vehicles being loaded on Wednesday morning to be carried to the Chrysler Proving Grounds at Chelsea, MI for the coastdown event. This entry was posted in PIAXP X PRIZE and tagged Chelsea, Chrysler proving grounds, coastdown, MI, MIS, PIAXP, X PRIZE. Bookmark the permalink. Great job with the updates on the Blog. The Fastest and Best vacation I ever had, was with Team Peraves at the 2004 Brno event. Roger if you, or anyone else from your team needs assistance or logistical support in Washington DC, before, during or after the Xprize award ceremony, I am your man. I live about 25 miles (40.2 KM) from the award ceremony location. I have a nice sized house with garage space, and barbeque grills if you need it, while you are over here. I offer you whatever I have, that you may need while visiting this area. If you don’t need anything, I will still see you here in Washington DC on 16SEP2010 at the X awards, I will be with Dan Whitfield. Ride Safe. Looking forward to seeing all of you again.